Join the discussion on our forums! Come discuss Catrina Muerte over in our dedicated Catrina Muerte discussion topic. At the end of your turn, summon a friendly minion that d ied this game. I love the card, just can't seem to make it work right. After seeing Archmage Vargoth in play, I guess this card will be OP. Silence Priest can benefit from this card as it resurrects big bodies, targets for silence. 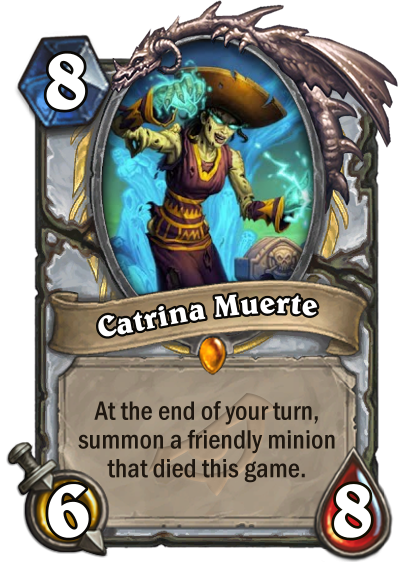 She is a slightly tweaked Kel'Thuzad, since the effect happens only at the end of your turn, and only summons one minion that died this game. This all is good, but it is sad we didn't get the same card (maybe a neutral or mage version of this), with a reiteration of the beloved KT.. This is the villain expansion after all. I guess now we must fall into submission at this point. All hail Big Priest.